The major story in the hours leading up to the game was Pellegrini’s use of James Milner in central midfield. It had been assumed that Fernandinho would partner Fernando, in the absence of suspended Yaya Touré, but Milner was selected instead. This can by explained by Pellegrini’s central marking system, which failed dramatically. The team operated in a 4-4-2 shape without the ball (although it seemed as if Pellegrini wanted Džeko to occupy Busquets; something he did only in the very early stages of the game). But the issue was not with the shape: a number of teams have defended well against Barcelona with a similar defensive shape. In central midfield, Milner & Fernando were told to focus chiefly on their opposite number, Rakitić & Iniesta. Given Luis Enrique often pushes his outer central midfielders high and wide, this seemed an odd decision from Pellegrini. Fernando fulfilled his responsibilities fairly well, and restricted Iniesta to a role in which his primary responsibility was recycling possession rather than impacting the game from an advanced position. Milner, however, was less successful. Rakitić was able to drag Milner out of central midfield regularly with clever movement. This gave Lionel Messi a clear path into the centre of the pitch, running with the ball at pace. One of Messi’s primary skills is his ball control at full speed, which is more impressive than most players have when they are stationary. Running at pace at an exposed Man City defense, he was able to cause havoc because Milner was often in the wrong place. This meant Messi was allowed to run the game. With 107, the Argentine maestro had more touches of the ball than his two forward partners combined. It meant Neymar & Suarez (despite the goals) were something of a sideshow; a factor Barcelona wouldn’t be too disappointed by. For all of their strengths, Messi is always the man opposition managers should be trying to shut down when they play Barça. Pellegrini badly failed at this. Vincent Kompany: the impossible job? In the aftermath of the game, there was huge reaction to Kompany’s poor performance. The Belgian stepped up into midfield all too often, and was regularly half a yard slower than the Barcelona midfielders, leading to late/missed challenges. But Pellegrini’s insistence on his central midfielders man-marking left huge gaps in the centre of the pitch that Kompany instinctively wanted to close. Such a scenario occurred for Barcelona’s second goal. Again Fernando has drifted too wide, following Iniesta. Jordi Alba does well to realise this and immediately pushes the ball back into the dangerous central area. As Rakitić is on the edge of the area, no-one is in an orthodox ‘strikers’ position for Barcelona. It therefore makes sense for Kompany to attempt to close the man. He is slightly too slow and Rakitić is able to offload well. Zabaleta then charges forward and Messi beats several men before offloading to Alba. David Silva has had to cover for Zabaleta, and is not able to recover the man he was supposed to be marking. It takes some good movement from Suarez, and Barcelona have the ball in the back of the net again. Situations like this arose fairly regularly and it made it extremely difficult for Kompany & Demichelis. City’s failure to produce a structured pressing system was one reason Barça found it so easy to gain central penetration. After the game, Pellegrini bemoaned his players and said they didn’t press well, but the system he implemented was simply too naive. It was far too easy for Barça to build from the back as the positioning of City’s two strikers and wide midfielders was too aggressive. This meant Barça almost always had a passing option. More often than not, Busquets would receive the ball in huge amounts of space. 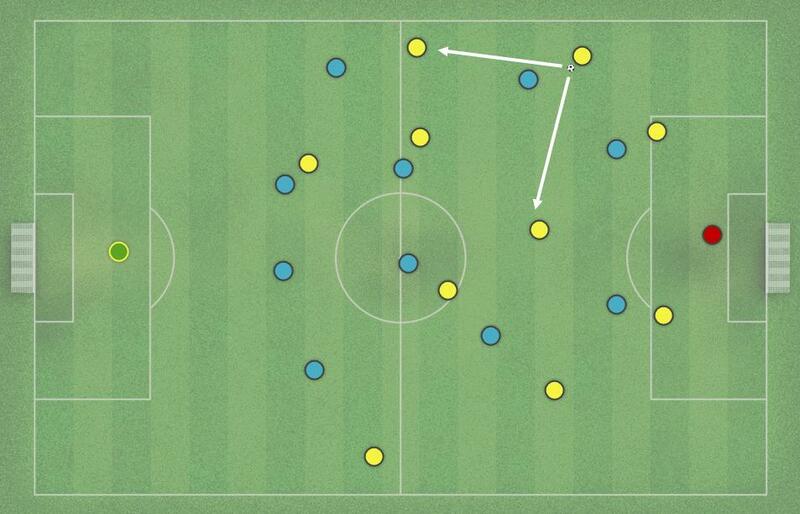 This resulted in a midfield overload for the Spaniards and they were able to transition quickly. Sometimes the full-back would choose to play the short pass down the line to Messi (or Neymar), who would be able to turn and run at his man. If Man City were able to pressure him, then Suarez would be able to run the channel and supply a suitable long-ball option too. Barcelona rarely needed this. The main person at fault here was Edin Džeko, who appeared to be tasked with occupying Busquets; he didn’t bother after the first 15 minutes. In the end, the 4-4-2 wasn’t to blame, but it certainly contributed to City’s demise. If Pellegrini was so intent on such a pressing style and man marking of the central midfielders, he should have used a 4-3-3 with Fernando occupying a deep central role and Milner & Fernandinho shuttling in the channels. Whilst even fantastic preparation can be blown away by the strength of Barcelona’s attack, Manchester City and Manuel Pellegrini did themselves no favours. When facing a strikeforce of Barcelona’s power, it is often a case of selecting the lesser of two evils. But Pellegrini seemed to forget about by far Barcelona’s most potent weapon: Lionel Messi. Brilliant analysis. Suicidal decision by Pellegrini to play the way he did. Barcelona can make it look like they have a spare man in midfield at the best of times without actually giving them one. It always baffles me as to how the us, the armchair tacticians, can see these things and make not of how to rectify the problem. Yet, it doesn’t seem as if these managers do. Even in today’s game against Liverpool I thought Pellegrini made some tactical mistake in his substitutions and even his play style throughout the match. They were on the backfoot for the entire second half. Completely agree. I’d presume it’s stubbornness on the part of the manager rather than incompetence (at least I’d hope so!). I think It’s stubbornness and the tendency to trust your players to rectify the on field situation on their own, rather through a tactical change. Manchester City should have win yesterday match. They could score Penalty and then more goal at the end as Joe Hart already saved goals.